2018 WBE Conference — Maestro Quality Inc. Welcome to the download page. We are delighted to provide these templates and best practices that we have developed during our process. We want to make it easy for you so that you do not need to reinvent the wheel. Post conference note: During the WBE to WBE session on Thursday, September 27, there was information and opinions shared regarding the value and effectiveness of supplier-diversity directories and portals. While the opinion was expressed that there is very little value and effectiveness, we would like to stress that supplier portals are connected to corporations’ supplier gateway and payment systems. If and when you land a contract with a corporation, you will need to eventually go through the portal to process contracts, purchase orders, and payment. Hence, we recommend that you prioritize your efforts and add your company information in the portals for the corporations whom you intend to market and win contracts. Also, the template for collecting your company information will be critical for efficiently updating your profile on the new WBE Canada database scheduled to debut January 2019. Start to prepare this information now. If you need assistance, please contact us to discuss how we can help you. If you do not have the resources and you are interested in hiring the right person who is experienced in the process to make your work even easier, we are here to help. 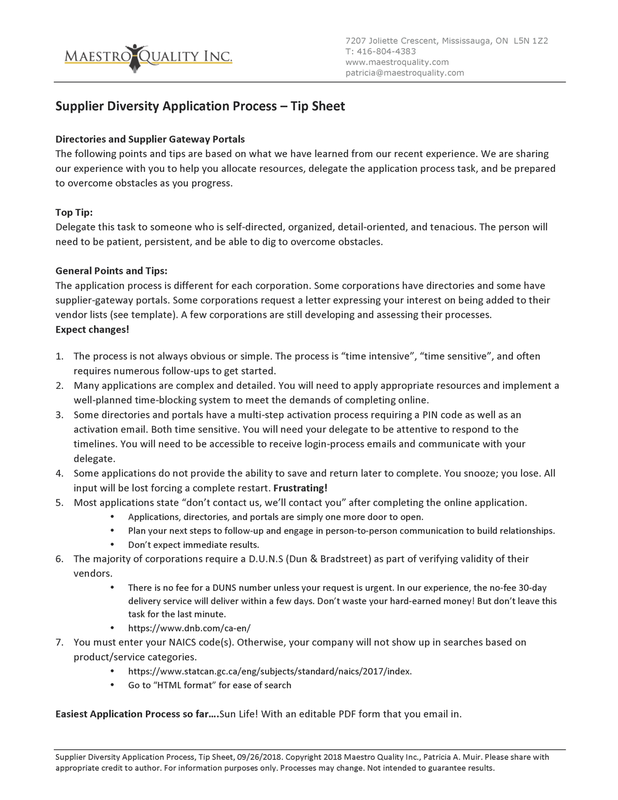 This PDF tip sheet is based on what we have learned from our experience in working through the supplier-diversity application process. We are sharing our experience with you to make the process much easier, efficient, and effective for your company. TOP TIP: Delegate this task to the right person. Give him/her the time, resources, and access to information required to complete the process. He/she will need access to company confidential information. 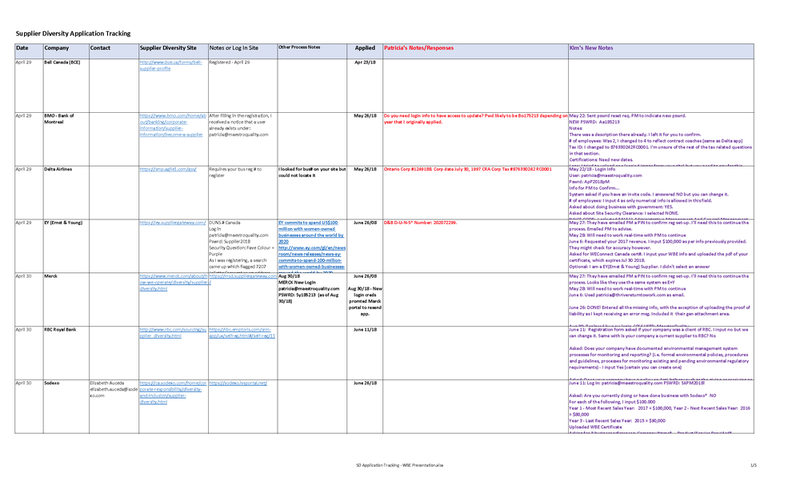 Use this Excel tracking template to record all activities and communication notes during the application process. We have provided this template with all relevant contact information and links to corporate supplier-diversity web pages, directories, and portals. We have provided examples of notes that we have recorded to assist in tracking the process. Use this Word document to develop your own company information template. This document has been populated with some Maestro Quality Inc. data as examples. Cut and replace with your data as appropriate. 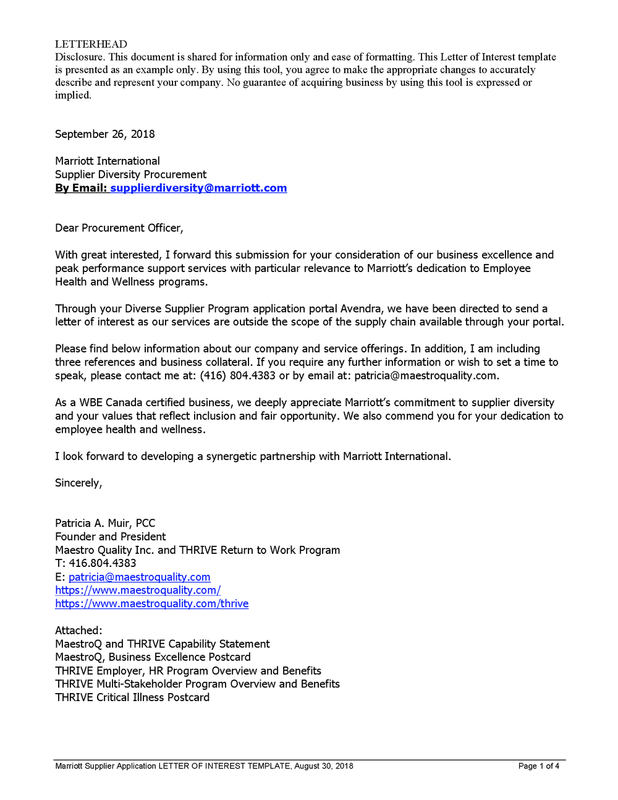 Collect basic company information and build your own template for copy and paste into supplier-diversity directories, supplier-gateway portals, and requests for letters of interest. TIPS: 1. Create different versions of your company description to meet the restricted character requirements. 2. Note when new requirements are presented and identify by corporation. 3. Update as you go. If, by chance, a directory or portal fails to save your input, you will be relieved to have this document to reduce rework time and frustration. Use this Word document as a template for creating your letter in response to some corporation’s request for “Letter of Interest” when your product/services do not meet the criteria for the corporate directory or portal. This template is populated with Maestro Quality Inc. contact information and description pertaining to relevant interest. You are welcome to use what works for your company and replacing what does not work. We want to make this process easier for you. We’ve done the work and we want to share with you. This PDF document provides valuable information that has been accumulated from several sources over several years to assist you in honing your Value Proposition and creating Capability Statement. Our Recommendation: You provide the data and hire a designer to create an attractive, eye-catching capability statement using your brand colours and being consistent with your business cards and other marketing collateral. Bonus: We added a list of “dos and don’ts” for new start-up companies and new WBEs and our encouragement to “Dream Big while Starting Small”.